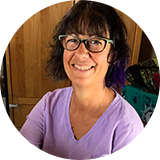 At Memories to Quilts I convert collections of clothing, especially T-shirts, into lasting treasures. Our clothing provides a record of the lives we live. How and where we work, our travels and recreations, entertainment, and how we participate in our communities are all represented in our clothes. They tell a story. Most of us, myself included, have stashes of T-shirts and other clothing tucked away in drawers and boxes that seldom see the light of day. So let’s convert those pieces of our life experience into a fun keepsake! I use only the finest materials and techniques to ensure the highest quality quilt possible. I arrange each quilt individually, and rearrange until the design has a pleasing flow. With me no detail is too small! I have a degree in graphic design and a long career framing fine art. I bring all my experience to each and every project. 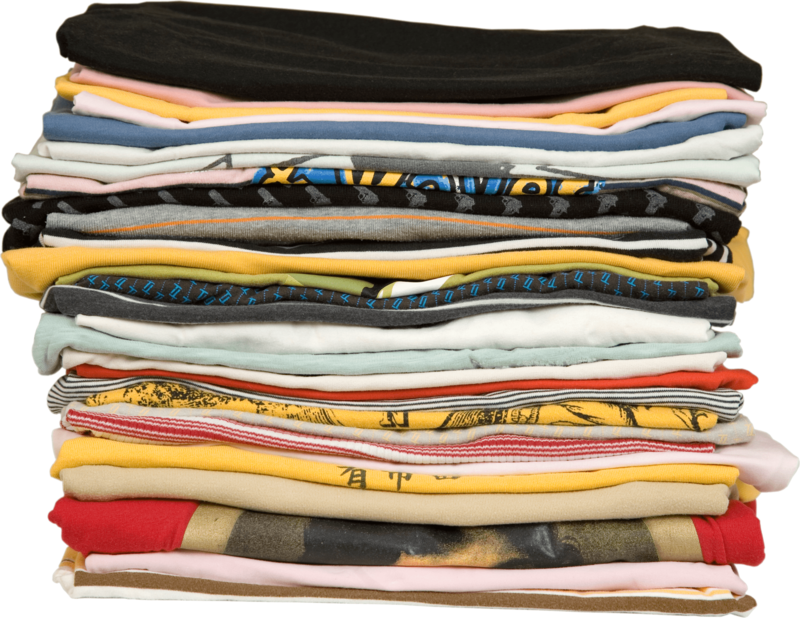 One of the most common T-shirt quilt themes. Pro, college, and high school sports teams are popular collections. 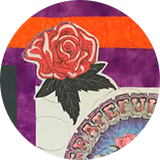 Jerseys, T-shirts, sweatshirts, bandanas and other memorabilia can all be incorporated into a quilt. Pull out your quilt on game day for comfort an added luck! Are you a runner with a collection of race shirts? Do you play a club sport and have a collection of jerseys and tournament T-shirts? Chart your travels with a quilt! Shirts from travel destinations make a great keepsake. Quilt a lifetime of travel or a group of shirts from a memorable trip. Do you have a collection of Hawaiian shirts that have shrunk in the laundry? Let’s put them into a quilt! 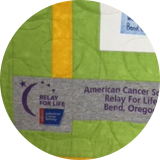 T-shirts from concerts, bars, breweries, conferences – literally anything under the sun can be made into a quilt. Sending a child off to college? 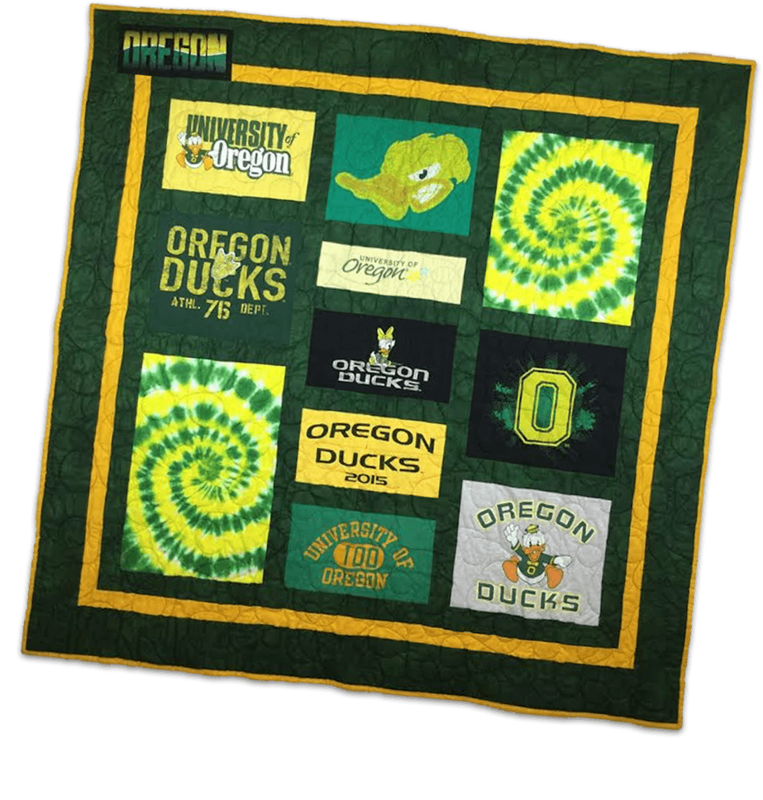 Reward the graduate with a quilt of memories to remind them of home while they are away. I’ve also made remembrance quilts from the wardrobe of departed loved ones. In addition to a single memorial quilt, I have made a number of smaller quilts for distribution to family members, and have had kind notes sharing how this has helped with the grieving process. If it’s important to you, it’s important to me. There are really no rules. If you have a vision, let’s build it together! Do you have a quilt that was left unfinished by your mother or grandmother? Or a project you’ve been struggling with? I’d love to help you finish it. I can also do some repairs.